0:09Skip to 0 minutes and 9 secondsHello, you may remember from my last story that I said, "but that's another story." And so, this is the other story I want to tell you about. 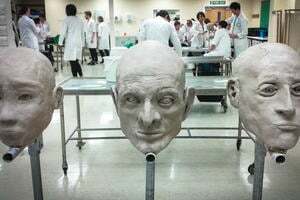 And it's to do with the manufacture of facial prostheses using what's often referred to as 3D printing. In the past it used to be referred to as rapid prototyping and is also referred to as additive manufacturing. What all these techniques have in common is the way we make things. Most of the time when we make things out of materials, we actually take a large block of the material and then machine away the bits we don't want. In additive manufacturing, what we do is we build the material up in layers, bit by bit. 1:06Skip to 1 minute and 6 secondsAnd the first example that I want to show you is an example here of a patient's skull made by a technique called stereolithography. Now stereolithography is a technique that's been around for some 15 years or more now for use in medical applications. It started out as producing study models. And this is produced from CT scans. You may be familiar with CT scans in the way that they produce slices through your body that you can then look at. And often, you see on programmes when the surgeon looks at the pictures from the CT data, you'll have a series of slices that they look at. 1:49Skip to 1 minute and 49 secondsWell, what we've done in this case is to actually take those slices from the CT scan and recreate the original three-dimensional structure. So we put them all back together again and then put that into a machine that prints it out, layer by layer. And so we end up with this model of the actual bony structures of the patient. 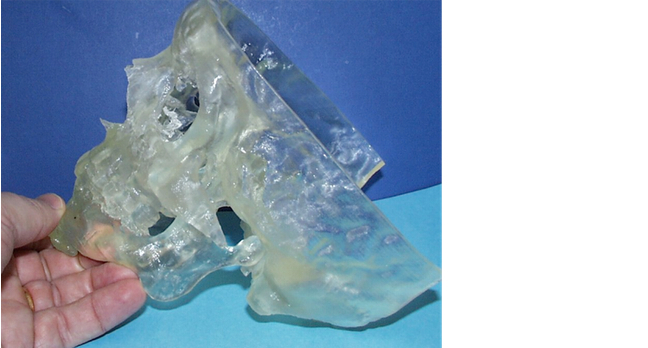 Once we have that model, we can then look at how we might make prostheses from that. One of the things I should also mention is that dentistry is not just about the teeth. It's about the whole face. And so a lot of work we do is with facial reconstruction, not just doing crowns and bridges. 2:33Skip to 2 minutes and 33 secondsAnd most of what I'll be talking about will be related to facial reconstruction, although I will be touching on crowns and bridges as well. 2:42Skip to 2 minutes and 42 secondsSo once you've got a model like this, it then becomes possible to use that model to create prostheses that fit nicely to the bony structures of the patients. If you look at many applications that you may be familiar with of implants, such as hip joints, or knee joints and so on, in effect, the patient is made to fit the joint. The surgeon will actually choose one that is the nearest in size for that patient. So you can imagine with hip joints, it would be something like small, medium, large. And then, the patient is made to fit the joint. In dentistry, we do things the other way around. We tend to make the implant fit the patient. 3:25Skip to 3 minutes and 25 secondsWe customise them to the individual patient. Now this kind of technology of additive manufacturing lends itself very effectively to doing that kind of work. And so the first thing we had to do was to establish whether or not these models that you could produce were accurate enough to actually allow you to produce an implant that would fit the patient. Because, obviously, you have to go for surgery. You have to put the patient under general anaesthetic. You have to open the patient up. The last thing you want is that with the patient, in theatre, opened up, that you find the prosthesis doesn't fit. 4:06Skip to 4 minutes and 6 secondsSo we have to be sure that the transition from the CT scan to a model gives us an accurate reproduction. And we did this with the first one. This is the same patient I showed you earlier, but we actually made an implant for that patient, a customised implant, made in titanium. And alongside that, the surgeon also had available an implant made by the more traditional route, which involved creating a titanium mesh. Now the advantages of the titanium mesh for the surgeon at the time was that they could actually model and shape the titanium mesh because it's easy to bend. So if it didn't fit perfectly, they could actually change it. 4:48Skip to 4 minutes and 48 secondsWith a prosthesis like this that we've made, it has to fit perfectly. And so this is the first one we did. It did fit perfectly, so by that process, the confidence of the surgeons that we could actually make an implant that would fit the patient based on the patient's original CT data became a reality. 5:14Skip to 5 minutes and 14 secondsHaving established that we could actually make implants that fit the patient based on the patient's original CT data, the next example is this one here which is of a young man who had an asymmetry of the lower mandible. And the surgeon asked us to make an implant to rectify this. And what we did was once we have the CT scan data, we did the 3D reconstruction. We now have a 3D, digital model of the patient's skull. What we then did was we took the left-hand side-- if you look at it that way round-- took the left-hand side of the mandible, and then mirror imaged it to the right-hand side. And then, subtract one from the other. 6:00Skip to 6 minutes and 0 secondsThat tells us what the difference is. And then trim that. And that then defines the implant shape that we needed. Once the surgeon had agreed that this was an implant shape that he was satisfied with, and we went to the AMRC, which you see behind you, and we asked them to actually machine it out of a block of titanium for us. And so this is actually an aluminium replica of the one we have machined in titanium. Can't show you the one machined in titanium because that's in the patient. And so this was an example of where we successfully made a customised implant using the process of stereolithography to produce the skull models, and then digital design, and digital manufacturing. 6:45Skip to 6 minutes and 45 secondsThis is quite a simple shape to make. And often, you get situations where the shapes are much more complex. And that was the next case that I want to describe to you. And I haven't got the skull of this patient, but this is actually a patient who needed an implant to repair a hole in their palate, the upper jaw bone. It's a cleft palate patient. I don't know if you're familiar with cleft palate patients, but with cleft palate there's a whole in the upper jawbone. Very complicated problem because whenever you try and eat, food gets through that into the sinuses and so on. And very difficult to actually block that hole. 7:25Skip to 7 minutes and 25 secondsSo we wanted to actually block that with an implant. Now because of the shapes involved, it's not possible to do this by using machining techniques like we did in the previous case. And so this is where we actually went on to additive manufacturing the actual implant itself, in this case, in titanium. And so in the same process as stereolithography builds up the model in resin, layer by layer, in this case, this implant has been made by building up in layer by layer, but from metal powder. And so you have a bed of metal powder and a laser beam. And the laser beam scans the metal powder. And where it hits the metal powder, it fuses it together. 8:14Skip to 8 minutes and 14 secondsAnd then once it's built up a layer, another layer of powder's put over the top. And then, that is laser sintered, and then that builds up the 3D structure eventually. And you can produce very complex shapes that way. And this is a very complex shape. And in this case, the opportunity was there, as well, to solve another problem for this patient because this patient would also have a missing tooth. Because of that missing bone, there would be a missing tooth in her upper arch. 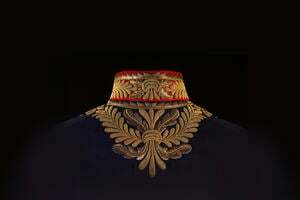 8:42Skip to 8 minutes and 42 secondsAnd so we actually designed this such that there was a small peg protruding through the soft tissue in the mouth that allowed us to put a crown on that peg and so replace a missing tooth in her upper arch. So we actually solved two problems simultaneously. We closed the defect in the palate, and we also gave her a full smile again for the first time in her life. So that's an example of using that kind of technology. Now that is now also moved into the dental side where we make bridge frameworks, crown frameworks, and so on by using 3D manufacturing. And this is already being used commercially. And so this is an example made in cobalt-chrome. 9:39Skip to 9 minutes and 39 secondsThe advantage with this method of processing is that to make these in the machine that does this, you can do 100 or 200 at a time. Now normally, if you want to make a framework like this, the technician sits at the bench, has to wax up the shape that's required, takes that waxed up shape, and actually puts it into a refractory, or what we call a high-temperature resistant mould, has to burn out the wax, and then has to melt metal and pour that into the mould by what's called the lost-wax casting technique. 10:22Skip to 10 minutes and 22 secondsAnd that has to be done for every one individually. So you can imagine how much time saving there is when you can do 100 of these by one printing process in about three hours in one of these machines. And all the design work is done on the computer, not with wax sitting at the bench. And the cost savings there, in the long term, are going to be potentially significant. 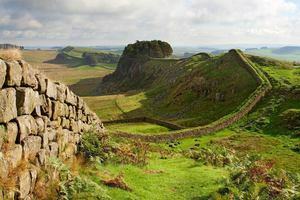 Also, it opens up opportunities to use different materials, materials that maybe we've not have used in the past. We tend to use a lot of cobalt-chrome in dentistry because it's an easy material to cast. 11:01Skip to 11 minutes and 1 secondBut when you go onto additive manufacturing, it opens up the door to using other materials, many that are used in the aerospace industry like titanium alloys, which are much lighter, and potentially also more biocompatible than the cobalt-chromium alloys. 11:18Skip to 11 minutes and 18 secondsTo go a bit further, there is also a way of actually doing 3D printing in colour. All the other techniques, we either make a plastic object or a metal object, and it's all in one colour. But you can actually do 3-D colour printing. 11:37Skip to 11 minutes and 37 secondsI was introduced to that technology, that idea, about six or seven years ago. 11:45Skip to 11 minutes and 45 secondsHaving seen the machine in operation, I thought, this has the potential for producing facial prostheses. At that time, nobody obviously had done that. And so we then started a research project looking at facial prostheses. I worked in conjunction with a company based here on the Advanced Manufacturing Park, called Fripp Design and Research. And between us, we actually worked very hard over the next few years to allow us to print 3D prostheses. And here, this is one example. This is a nose that's been printed in 3D. What I have here is one that's been manufactured by hand. Ours are not perfect, but this is the first trial of doing this process. But they're pretty good. 12:33Skip to 12 minutes and 33 secondsNow one of the big differences between these is cost. This takes about a week of a technician's time to sit with the patient to make the prosthesis. Ours, we actually take an image from the patient, and then, everything is done on a computer in terms of designing afterwards, and then printed on a machine. So we don't have to have the patient there all the time. And once the prosthesis is made, if we need a new one, all we have to do is press the button on the printer and print another one. In the case of the handmade one, the patient has to come back and another week is spent actually making the prosthesis. 13:11Skip to 13 minutes and 11 secondsDifference in cost, to remake one of these is about 150 pounds. To remake the handmade one, you're talking maybe 3,000 pounds. So that's an example of where we've used additive manufacturing to produce 3D coloured objects. And coming back to the dentures, those of you who remember the earlier presentation where I said we made dentures out of acrylic-- here's an acrylic denture, and that's what we still do today-- what I'm holding in my right hand here is probably the world's first 3D colour printed denture. It doesn't look very similar at the moment. The colours are all wrong, but it is a step in direction of actually making dentures by 3D printing. 13:59Skip to 13 minutes and 59 secondsAnd the direction things are going now is such that 3D printing will be the new way of actually making dental prostheses. Whether it's an implant customised to the patient, or whether it is a crown, or a bridge, or a denture, 3D printing will be the way forward. Thank you. For this research case study, we’ll revisit Professor Ric van Noort, this time to learn about his research into the advanced manufacture of facial prostheses, especially for facial disfigurement. Below are some images of the prostheses described in the video, and an example research paper on the ‘fit’ of crowns produced using computer-controlled manufacture. A 3D printed skull produced from a CT scan (computerised tomography scan, also known as a CAT scan) used to construct facial prosthesis. 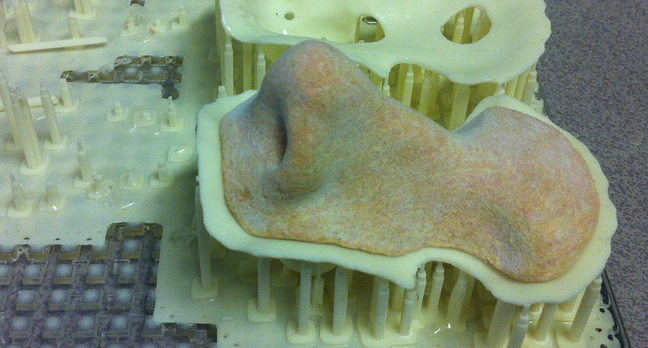 Experimental 3D printed nose produced using powder and binder printing combined with up to four inkjet heads to reproduce colour. Currently produced from a scan of the original prostheses, but computer design methods are being researched. 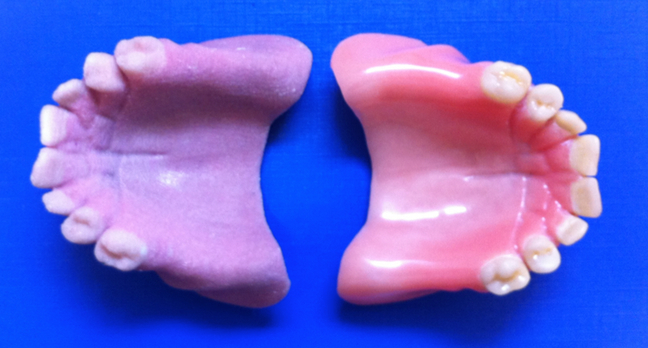 Experimental 3D printed denture (left) produced using powder and binder printing. This one was produced from a scan of the original made using the conventional laboratory technique, but methods to produce the complete denture digitally (from a digital scan of the mouth to the printed denture) are currently being researched.